Cycling is in my blood and something I have always loved, my parents even met at the local cycle track and due to my Dad being a racing cyclist himself, I was bought up watching and taking part in the sport from an early age. I started racing at my local track league (Preston Park in Brighton) at the age of 7. This would be where I first came across Lee Povey who was just a youngster himself at this point starting to make a name for himself in the senior ranks. Unfortunately at the age of 13 my parents got divorced and I stopped cycling as a result of this. Due to the emotional ties between Preston Park and my family I thought it was too hard to continue racing there. By now I was playing football too so this became my sporting interest until I was 23. There was however always a nagging thought in the back of my mind about not fulfilling my potential at my first love cycling. I stumbled across Lee’s coaching website after getting in touch with an old cycling friend on facebook. I was impressed by the testimonials I read on the site and how Lee had helped people from all different backgrounds, abilities and levels of experience. I emailed Lee and soon afterwards we had arranged to meet up for a chat. Straight away Lee made me feel relaxed and at ease with his friendly and approachable manner. We talked about what type of coaching I wanted from him, my fitness, work and personal commitments as well as the reasons why I wanted to come back to cycling after 10 years away from the sport. After this chat there was no doubt in my mind that Lee was the coach I needed, I decided that night to quit football and fully commit to cycling under Lee’s tuition. At the time I was training for a half marathon as well and Lee was only too happy for me to continue doing this and he factored this in to my weekly training programmes. Since then I have not been disappointed with my decision at all. Lee understood that to begin with I lacked confidence and felt under pressure to emulate my Dads success as a rider. He was very patient and understanding considering my lack of experience at racing in a bunch. Lee never puts pressure on me and if I have had a bad ride is always on hand to talk it through with me so that I can learn from the inevitable mistakes. I have come a long way in the four years I have been under Lee’s guidance from a slow start in my first season to now having several wins to my name. Lee has transformed me from a nervous and unconfident rider into the rider I am today. 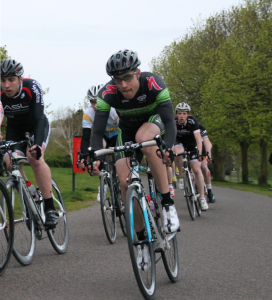 My best results to date were my 4th overall in the Sussex track (A) league and numerous top five places in road racing. I still have a lot to learn and big improvements to make to get to where I want to be but I have no doubt that I can achieve this with Lee’s continued help and support. Without him I would still be playing football wondering about what might have been.